« Back Wil Wheaton’s Tabletop Season 3 – Get Ticket to Ride Steam as a bonus! Small World 2 is the digital version of our best-selling fantasy board game. When we built Small World 2, we loaded it up with features – 2-5 player maps; online play with players around the world via the Days of Wonder Online network; Solo play against the AI; rankings and lots more. Fans of the game have really loved playing it. But we wanted to make it even better! For the past 6 months, we’ve been hard at work on the next digital version: Small World 2.5. We’ve added a new “Online Arena” with a live lobby, a list of open games, and full chat capability; support for single-session games, with a new Player Clock for competitive game play; a new Stats screen at game end; improved AI and much more. Before this new version launches, we want to make sure we got it right, and that it really scales up, so we would like to get as many concurrent players as we can competing against each other in the coming days. 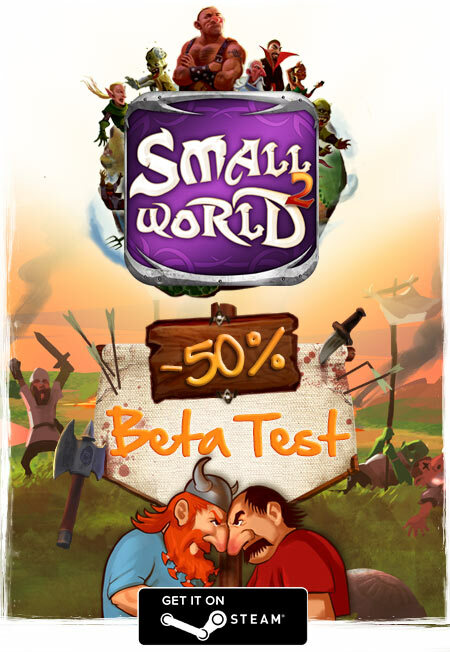 Which brings us to this offer: If you’re already playing Small World 2, we invite you to join the Small World 2 Beta Test Program, where you’ll get early access to all the new features. If you’re not yet a Small World 2 player, or if you have a friend you’ve been meaning to invite to join in the Small World fun, now is the time to do so: For a very limited time, Small World 2 for Steam, which runs on your PC, Mac (and even Linux, with this new version!) is available for 50% off the regular price! Even better, all the Small World expansions for Steam – Cursed!, Grand Dames and Be Not Afraid… – are also half price, making it the perfect time for existing Small World 2 users to add these new Races and Special Powers. Of course, once you’ve installed the game, be sure to sign up for the beta program so you can help us test version 2.5 as well. This entry was posted on Thursday, May 15th, 2014 at 18:41 and is filed under Days of Wonder Online, Games, News, Small World. You can follow any responses to this entry through the RSS 2.0 feed. Both comments and pings are currently closed. Is this deal over yet? It doesn’t say when it ends…. Im’ interested but I can’t find anything about 50% off on Steam. I love this app but I would really love for there to be AI in local multiplayer mode. My GF and I play this game on our iPads but we want to have AI opponents in the local mode with more than one iPad (I know there are AI opponents in pass-and-play). I would really appreciate this feature! !